Spring has sprung! Let's celebrate in one of the most sought after venues in Istanbul. Ruby Bar & Club is known as one of the most glamorous places in Istanbul and we invite you to our Spring Party on Thursday, 25th April. Come and mingle with other global minds in a beautiful place. 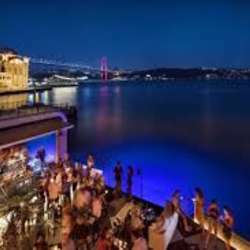 Ruby is set in Ortakoy, it has a wonderful location next to the Bosphorus. The resident DJ will perform great party music from 21.30 onwards, so be ready to dance :) If you would like to network with fellow global minds, please come before 21.30. Please note that the lounge tables are reserved for InterNations until 23:30. Every guest receives a free welcome drink . You are welcome to bring your friends as your guests. Please arrive before 22.00 to ensure admission, after this time it will be at the club's discretion who they admit. The Venue will also charge their own cover fee after 22:00. If you would like to have dinner please book directly with the venue. Entrance fee is cash only, Credit cards are not accepted.